The Nokia Lumia 900 is the Windows Phone I’ve been waiting for. After months of rumors and speculation, Nokia President Stephen Elop introduced the world to Nokia’s flagship Windows Phone at a press conference yesterday at CES in Las Vegas. I had the chance to get my hands on the Lumia 900, which is undoubtedly one of the hottest phones at CES. And yes, I was impressed. Ever since the debut of Windows Phone 7 two years ago, I’ve felt that Microsoft was a little behind in the hardware department. That isn’t to say that the crop of initial Windows Phones from HTC, Samsung, and LG weren’t good, but it was hard not to feel like they were lesser versions of those manufacturer’s high-end Android phone. When Nokia announced it would be hopping on the Windows Phone train, I was excited. As I’ve written many times before, I’ve always loved Nokia hardware--particularly the Carl Zeiss cameras--but I didn’t like the look and feel of Symbian. Windows Phone seemed to have the opposite problem: great OS, uninspiring hardware. Put the two together and they should make a pretty darn good phone, right? The first Lumia phones we saw sort of fulfilled my wishes. The Lumia 800, the flagship phone for Europe and Asia, had that signature high quality yet durable Nokia build, but the display seemed a bit on the small side. Plus, it's missing a front-facing camera (even though the Mango update for Windows Phone adds support for dual cameras). Enter the Lumia 900: Nokia saw which phones were doing well in the United States, and refined and added to the Lumia 800 so it could be competitive. The 900’s display got bumped up to 4.30 inches (from 3.7 inches), added a front-facing camera, and--possibly the best addition--added support for AT&T’s growing LTE network. The Lumia 900 did not disappoint in this hands-on at CES. The Lumia 900 beautifully showcases the Windows Phone OS. The body is made from a single injectable polyurethane matte plastic build, as is the Lumia 800, which gives it a sturdy feel. The material is soft to touch, but resistant to scratches (although not necessarily fingerprints). And it doesn't feel like it will completely shatter if you drop it. The bold bright and bright colors of Windows Phone look smashing on the ClearBlack Super AMOLED display. The display is slightly curved, too, providing good viewing angles and reduced glare. For me, the most exciting feature is the 8-megapixel Carl Zeiss lens with F2.2 aperture. The Lumia 900 has a dual wide-mode function allowing you to take wide-angle shots. I wasn’t able to test the Lumia 900's camera on the showfloor, but when I tested the Lumia 800's camera a few months ago, I was impressed with the snappy shutter speed and high quality photos. There are some worrisome issues, however. It's hard to say how tough using AT&T's LTE network will be on the Lumia’s battery. Nokia claims up to 7 hours of talk time and all-day battery life--but does that include on LTE? Additionally, in a world of dual-core and soon to be quad-core phones how will the Lumia perform in comparison? 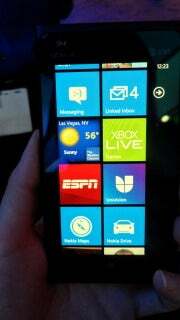 Windows Phone is a very light-feeling OS and during my quick hands-on, I didn’t notice any lag or sluggishness. Still, further testing needs to be done. Despite these issues, the Lumia 900 is an exciting addition to the world of Windows phones, and might just be the phone to win over consumers who might be hesitant of the OS. I just wish the Lumia 900 came in hot pink like the 800 does, but I guess you can’t get everything you wish for.